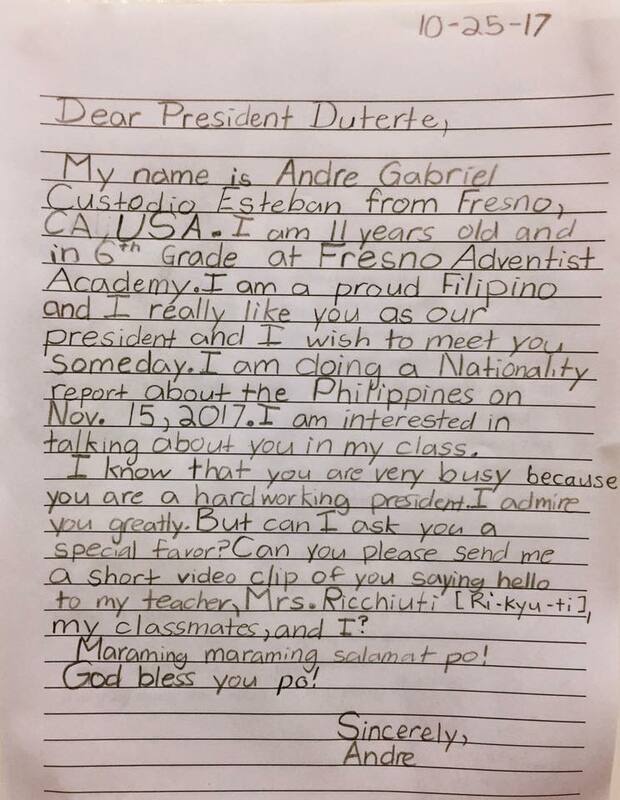 President Rody Duterte is a very busy man, but not too busy not to happily oblige a 6th grader’s request for a video for his class’ nationality report. Just recently the letter of Andre Gabriel Custodio Esteban went viral after it was posted by his mother Almyra Grace Esteban on her Facebook page. 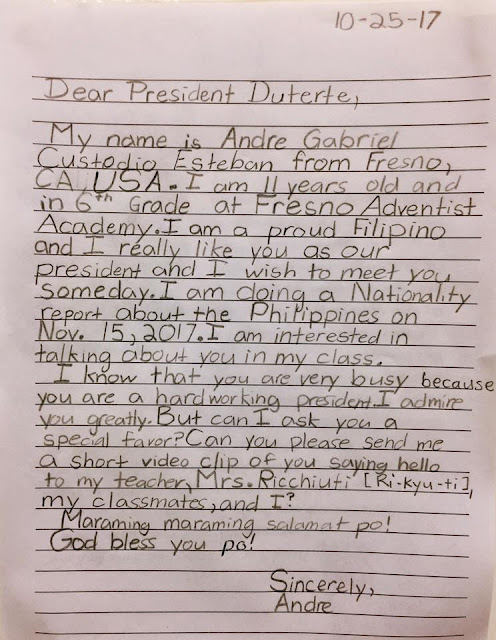 In his letter Andre, who is a student in Fresno, California, USA requested the president, whom he “admires greatly” for a short video clip saying hello to his teacher, Mrs. Ricchuiti, his classmates, and himself. "My son wrote a letter to Pres. Rodrigo Duterte. He has a special request to him for his Nationality Report on Nov. 15, 2017. Can you please help us how to send this to our dear president?" Almyra Grace Custodio wrote on her Facebook page. The letter reached the president and granted the request of Andre. His video message was posted on Special Assistant to the President Christopher “Bong” Go’s Facebook account. On the video, the president said hello to Mrs. Ricchuiti, which he pronounced right, her students, and Andre. We hope you get an A+ Andre!